Flowering Maple (Abutilon) is a houseplant grown during the winter. They do occasionally grow outdoors in the warmer months. There are many different species to select from when choosing your Maple. Whatever type you choose, it will surely be a great pick. 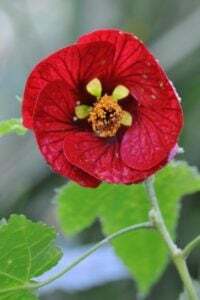 The Abutilon can bloom in many different colors. Some of the colors are yellow, orange, pink, white and red. The plant can be very large, but majority of the plants sold today are of the dwarf variety. You can grow you flower in a pot or in a hanging basket. Usually the ones that grow straight up are better suited to a pot, while the cascading type fill out a hanging basket better. Abutilon that grows straight up grows on a very tall sturdy stem. The leaves on these plants resemble maple leaves. Hence where they got their name from. The flowers hang off of the stem and look like tiny bells. They are very small and delicate looking. Flowers of the cascading variety grow outdoors in the warmer months. Keep them pruned and trimmed in order to promote a full and bushy plant. Place them in a pot with plenty of room to grow. They do not like to feel smashed together! Abutilon is not the easiest to grow and to be maintained. It takes a little bit of work. Plant your plants in a regular potting mix. In the indoors in the winter they need to be around full sun. In the spring or summer, the outdoors plants like to have a little more shade. 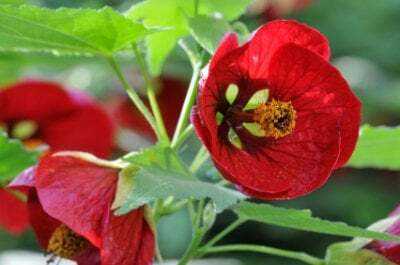 Abutilon needs to be in temperatures of 70 degrees in the daytime, and around 55 to 60 degrees at night. This is the tricky part because you want to make sure your flower is set in the right climate. Gently mist your growing or full grown Flowering Maple plant every day to keep the moisture even. As stated before, trim the plant as needed to keep a nice shape and to promote new growth. This plant will grow all year round with proper care. It does not however go dormant so take care of it; because once it’s gone it’s gone for good.